Sarnath, Varanasi, India – The Central Institute of Higher Tibetan Studies (CIHTS), Sarnath, is celebrating the 50th anniversary of its founding. Yesterday, His Holiness the Dalai Lama flew from Delhi to Varanasi and was welcomed at the airport by the Vice-Chancellor, Geshe Ngawang Samten and local Indian officials. When he arrived at the Institute’s Campus it seemed that all the current students and many of the alumni who have come to attend the celebrations had turned out to greet him. This morning the sky was grey and foggy, the ground was damp underfoot and there was a chill in the air. Nevertheless, His Holiness was in good humour, teasing and joking with people who had come to see him, as he walked to the large marquee set up on the Institute’s recreation ground. In his welcome address, the Vice-Chancellor described the great pleasure His Holiness’s presence brought to the proceedings. He welcomed the more than 250 alumni from different parts of the world who have come to attend a Conference on Mind in Indian Philosophical Schools of Thought and Modern Science and the formal celebration of the Institute’s golden jubilee. He observed that interaction between different philosophical schools is a longstanding Indian tradition. Mind is a pervasive topic of interest, because of the acknowledged role of mental transformation in the achievement of happiness and peace. In the last 20 years or so, he added, science too has begun to take an interest in this. Meanwhile, CIHTS has an ongoing interest in fostering a combination of ancient and modern approaches to education. Next, the Vice-Chancellor invited His Holiness to inaugurate the conference with his opening remarks. “Respected sisters and brothers,” he began. “It’s a great honour to participate in this important meeting. This is still the early part of the 21st century, a time when we might hope for positive change. As human beings we have a remarkable intelligence and yet we tend to put it to destructive use. We are prone to follow our centuries old habit of trying to resolve problems by resort to the use of force. According to the new reality in which we find ourselves, this is entirely out of date. All 7 billion human beings on this planet live in dependence on each other. We are part of a global economy that has reduced the importance of national boundaries. What’s more, we are all subject to the effects of climate change. “Instead of trying to resolve our differences by force, we must talk and enter into dialogue. This is not a sign of weakness, but of wisdom—a realistic approach. Possession of nuclear weapons is no help, because if they were used the result would be mutual destruction with no one emerging the victor. Despite this too many people think that ever more powerful weapons are the answer. They’re happy to pour more money into military budgets. “How does this come about? It occurs when we fail to use our intelligence properly; when we give in to anger and other destructive emotions. This is why we have to discuss how to impress on those who are young today the importance of cultivating a compassionate mind in conjunction with a more realistic view. “Modern education is dominated by material goals, with not enough time for inner values. Meanwhile, I have great respect for all religious traditions, which provide tremendous inspiration. However, Indian traditions that include the practices of shamatha and vipashyana have a particularly rich understanding of the workings of the mind and emotions. Vipashyana is about analysing reality while shamatha involves focussing our mental energy. Explanations of the workings of the mind and emotions are found in religious literature, but today they can be studied in an academic way. In his preamble to the first session of the conference, moderator Prof Jose Cabezon of the University of California, Santa Barbara, paid tribute to the Central Institute of Higher Tibetan Studies. 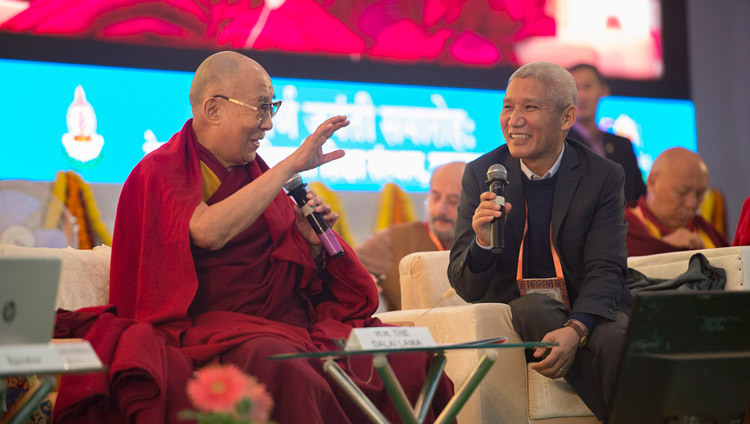 He expressed gratitude for the way it has not only educated several generations of Tibetans, but also for the openness and hospitality with which it has welcomed foreign students. Cabezon introduced the first presenter, Prof Shubada Joshi who as Professor of Philosophy at the University of Mumbai taught philosophy for more than forty years. She discussed the concept of mind in the Samkhya School of thought, one of India’s oldest traditions. The Samkhyas are a realistic school for whom only matter is real. They seek to put an end to suffering. They distinguish two elements, prakrti or matter and purusha or spirit. According to the Samkhyas, knowledge of manifest, unmanifest and the knower is necessary in order to destroy the suffering of a person that arises from bodily, natural or supernatural causes finally and completely. In other words, they provide a philosophical background for the practice of yoga. His Holiness remarked that it is evident that there were many intelligent teachers among non-Buddhist traditions in India as recorded in the works of Aryadeva, Dignaga and Dharmakirti. Bhavaviveka too compiled a virtual encyclopaedia of Indian thought. Cabezon added that the stricture in the Vinaya that Buddhist monks should spend no more than a third of their time studying outside Buddhist traditions suggests that there was interest in doing so. Prof Rupa Bandyopadhyay specializes in Advaita and Madhva Vedanta and has taught philosophy for more than 30 years. She is presently Professor of Philosophy at Jadavpur University. She began her presentation on the Concept of Mind from an Advaita Perspective by saluting pure consciousness. She stated that some schools, such as the Nyaya and Vaisheshika traditions, consider mind to be an internal sense organ. They accept a plurality of minds. Advaita Vedantins, however, do not subscribe to this conception of mind. They do, however, agree that the mind is an inanimate, unconscious entity, a non-eternal, composite entity that originates from fire. The Advaita view is that mind plays an important role in constituting the individual’s individuality. Prof SR Bhatt, an eminent philosopher and Sanskritist, an authority on Ancient Indian Culture, Buddhism, Jainism and Vedanta, took over as moderator. He introduced Sachchidanand Mishra, Professor of Philosophy at Banaras Hindu University with a deep understanding of Indian logic and epistemology. Presenting the Nyaya concept of Eternal Mind, he explained that Nyayas not only accept the duality of matter and mind but add another element. They propose soul, mind and body. Nyayas also accept the observation and inference that provides the basis for much scientific investigation. 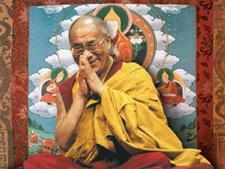 His Holiness remarked that until the last years of the 20th century scientists had focused their research on the brain rather than the mind. This is beginning to change, particularly since the recognition of neuroplasticity. He mentioned evidence he has witnessed of young children with clear memories of their previous lives and cases of spiritual practitioners whose bodies remain fresh for some time after clinical death. As yet scientists have no explanation of these phenomena, although some are exploring how to investigate them. Swami Atmapriyananda, who has a PhD in theoretical physics, is Vice-Chancellor of the Ramakrishna Mission Vivekananda Educational and Research Institute. In his presentation he touched on the meaning of Dharma as something that holds together. In questioning what really constitutes an advance in civilization, he suggested there is today an urgent need for what Buddhists call ‘right vision’, that in Vedantic terms is referred to as ‘awakening intuitive awareness’ and in Yogic parlance is called ‘light of higher wisdom’. Prof Bhagchandra Jain is Professor and Head of the Department of Jain Philosophy at RR Sanskrit University, Jaipur. In explaining the ‘Nature and Function of Mind in Jainism’ he said mind is sometimes called the sixth sense. Mind is of two types—consciousness and material mind. Without material mind consciousness cannot function. It is a means of knowledge, but is dependent on other senses in order to apprehend external objects. Mind is a common factor in all indirect cognitions and is capable of apprehending the past and future.